For over 15 years, Maze Rattan has produced quality furniture for the outdoors. 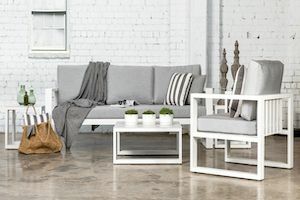 Maze Rattan collections are designed to provide comfort and style for moments lived outdoors. Our furniture is commercial grade and built for superiority and strength. With every purchase, Maze Rattan provides exceptional value and extraordinary service. Maze Rattan warrants all outdoor furniture and accessories to be free from manufacturing defects in materials and workmanship. 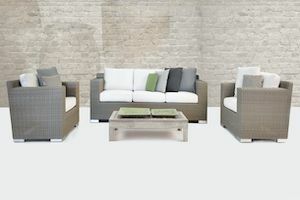 Provided the furniture is assembled correctly and is subjected to normal use, Maze Rattan will cover your outdoor furniture under the following three (3), two (2) and one (1) year warranties. 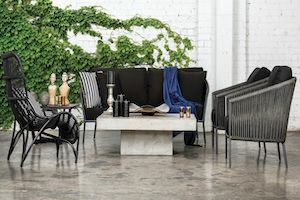 Maze Rattan warrants the powder coat finish on all aluminium frames for a period three (3) years from date of purchase against peeling, flaking and blisters. Maze Rattan warrants all Sunbrella fabric used in the construction of its outdoor furniture for a period of two (2) years from the date of purchase to be free from defects and against structural failure. Maze Rattan warrants all resin wicker products for a period of one (1) year from the date of purchase against any major discoloration on the product. This warranty is applied to the weave and also the aluminium frame upon which it is woven. Maze Rattan warrants all umbrella frames and umbrella bases for a period of one (1) year from the date of purchase against structural defects in workmanship and material. Maze Rattan warrants all replacement parts for a period of one (1) year. It is important that you take extra care of ALL of your cushions and fabrics on parasols as All fabrics with the exception of our Sunbrella products are NOT covered in your warranty. All glass must be inspected at time of delivery as once your delivery is accepted we will not be responsible for the replacing of damaged glass. Structural failure or damages due to incorrect assembly, lack of regular maintenance, improper use, roughness, abuse or neglect are not covered. Structural failure or damages due to use of furniture with other products not produced by Maze Rattan are not covered. 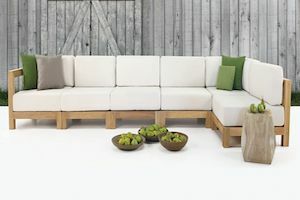 Normal wear or stretching of fabrics due to weathering or use, fading, minor discoloration, minor colour variances in the wood grain, resin or colour variance between replacement parts or pieces are not covered. Checking (minor cracks) may occur when wood products are exposed to outside elements. Checking is considered natural and is not covered under this warranty unless they contribute to structural failure. Damages or failure caused by freight or acts of nature (e.g. freezing temperatures, ice, hurricane, tornado, high winds, etc.) are not covered. Damages to wood product caused by environmental conditions (e.g. extreme dry climates), mould or mildew are not covered. Damages to rattan products caused by sources of heat (e.g. re, sunlight magnification through reflection of windows, stemware or from other sources, such as grill, fire pit, cigarette, etc.) are not covered. Damages to powder coated aluminium and steel products caused by environmental conditions (e.g. excessive humidity) or rust are not covered. The application of paint, stain, polyurethane, other chemical treatments not endorsed by Maze Rattan, or any modifications made by the end user will void the warranty. Maze Rattan cushions are not warranted. Sunbrella® warrants all fabric used in Maze Rattan cushions. For more information regarding the Sunbrella® warranty, visit www.sunbrella.com/en_us/how/warranty/. This warranty does not apply to samples or liquidated items. Maze Rattan recommends storing furniture out of direct sunlight and under a protective cover when not in use. 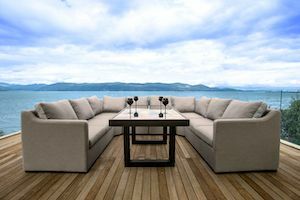 Proper storage, care and routine maintenance will help prevent structural failure and extend the life of the product, ensuring years of memorable outdoor living. Maze Rattan expects the purchaser has the knowledge to determine whether a specific product is appropriate for a particular commercial use or application. Maze Rattan will cover shipping charges related to warranty claims for a period of one (1) year from the date of purchase. After this period, the end user will incur all shipping related to warranty claims. Warranty claims should be submitted via email sales@mazerattanfurniture.ae. Proof of purchase (e.g. order number, purchase order number, etc.) and the original shipping address, and photo documentation of damage or failure is required for all warranty claims. When a warranty claim is submitted, a case number will be issued. This case number is required in all communication related to the specific warranty claim. Once the claim is submitted, Maze Rattan will determine at its discretion whether to repair or replace the defective part or whole piece of furniture. If a replacement product is provided, Maze Rattan will at its discretion determine whether the defective product should be shipped back to Maze Rattan or field-destroyed. Photo documentation may be required for field-destroyed product. In some cases, Maze Rattan will at its discretion issue a pro-rated charge for the length of time the product was used. EXCEPT AS PROVIDED ABOVE, WE DISCLAIM ALL OTHER’S WARRANTIES, EXPRESSED OR IMPLIED, AS TO MERCHANTABILITY OR OF FITNESS FOR ANY PARTICULAR PURPOSE, AND IN NO EVENT WILL WE BE LIABLE FOR ANY INCIDENTAL OR CONSEQUENTIAL DAMAGES ARISING OUT OF THE SALE OR USE OF OUR PRODUCT.